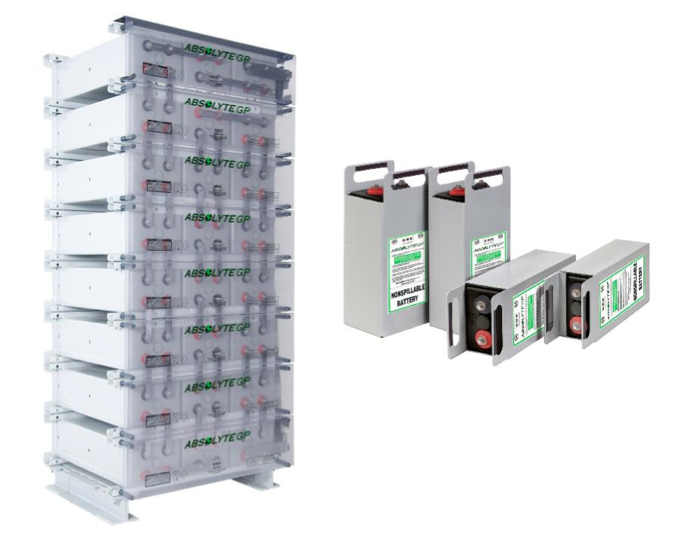 A world leader in valve regulated lead acid (VRLA) battery power for photovoltaic and alternative energy applications. Patented lead-calcium-tin-sliver positive grid alloy provides excellent cycle life for photovoltaic applications. Provides for extended partial state of charge operation and allows for deep discharge recovery. Wide band of temperature operation — retains more capacity in cold temperatures than traditional flooded batteries. Modular steel tray design provides excellent heat dissipation in high temperature applications. Housed in protective steel trays designed for maximum installation flexibility. Single cell modules are available that simplify transport to remote locations. Eliminates the need for periodic water additions as found in flooded cells. Periodic visual inspections, voltage readings, and connection retorquing is all that is required. Enhanced Post Access for maintenance and battery health assessment. Absolyte GP is qualified to stack horizontally up to eight high for use in 1997 UBC/2001 CBC Seismic Zone IV (at or below grade).